NBS Technologies Horizon High Volume Card Personalization March Demo Promotion. Customer must accept shipment by 3-31-16. Demo machines will have minor scuffs and scratches. Promotional Price: $243,000.00 (Price is less than dealer price). Price does not include shipping and handling. Contact Symco Group today at 800-878-8002 or email us at info@symcogroup.com to purchase your next NBS Technologies Horizon High Volume Card Personalization System. You demand innovation, choice, flexibility, and a smarter way of doing business. NBS gives you all the advantages you want with the Horizon, one of the most complete end-to-end card issuance systems available. The Horizon card personalization system is designed to be both scalable and flexible. The vast array of Card Personalization Elements (“CPE”) offered on the Horizon platform meet the current and future needs of the mid to high volume card personalization markets. The built-in flexibility of the Horizon allows for seamless customization as production requirements change. The single most important metric to most card personalization experts is cost per card. The Horizon platform achieves a significant advantage over competitive products in its range when it comes to cost per card. The Horizon’s performance, reliability and spare parts/consumable pricing yield the industries lowest cost per card. 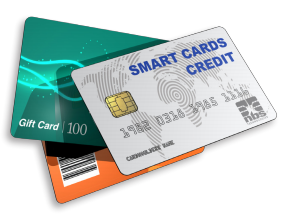 The Horizon hardware platform coupled with the SmartSys machine control software combines to make the NBS card personalization system simple to setup and operate while maintaining ultimate flexibility. The power of SmartSys is compatible with a wide variety of data formats and offers powerful yet easy to use tools such as a JDM (card design/ layout), machine performance statistics, audit trail tools that provide full traceability and a powerful set of machine diagnostic capabilities. This fully customizable, modular sys- tem is proven to provide one of the lowest cost of ownership in the industry. The Horizon is designed with performance, reliability, cost and service- ability in mind. NBS offers a wide range of cost effective product support services ranging from full on-site support to unlimited access to a global team of product support specialists. If cost of ownership is important to you, then the Horizon is the ideal choice for your mid to high volume card personalization system. The following details the Card Personalization Elements (“CPE”) available on the Horizon platform. The technical experts and sales teams at NBS know how to keep you up to speed with the rapidly changing card personalization market— whether you need assistance in facilitating a smooth migration from magnetic stripe to chip card technology or a quick response regarding any other card personalization concern. For expert advice and hassle-free support, the answer to your hardware, software, training, and maintenance issues is one phone call away. Includes two removable “quick change” magazines each with a 250 card capacity which means faster and easier card handling including pre-loading of blank cards. The Horizon has the flexibility to be configured with up to three input CPEs (6 Magazines total). Several different encoding types are offered such as, 300 & 2750 Dualco and 600 Oe (for JIS A, B, C options). Other coercively values may be available on a special order basis for an additional charge. Multiple encoder CPEs can be installed for user flexibility. Uses an elegant, elevator mechanism to simultaneously personalize up to 12 contact smart card stations in a single CPE. The Horizon smart card CPE utilizes the NBS proprietary coupler. The cycle time for personalizing is reduced by the number of stations. The selection of the number of stations is dependent upon the maximum anticipated programming time per card as well as the throughput rate of the particular Horizon configuration. This single station Contactless card CPE supports ISO 14443 type A & B as well as the Mifare range of cards. The CPE combined with SmartSys MCS software can also be used in readback and look up mode. Provides clear, crisp photo quality color images at a high throughput rate of over 700 cards per hour. This CPE has one of the best resolutions in the industry at 300 dots per inch (“dpi”). It can print in color or monochrome as well as applying overlay to multiple selected areas or the entire card for the entire run. The heated roller laminate CPE enables a laminate material to be applied to the surface of a card providing increased security and durability. A special laminate material is applied to the card surface using pressure and heat. The speed and temperature required is determined by the composition of the card being used. The Horizon will support up to 3 separate embossers. Software automatically divides work between multiple embossers for optimal throughput. A front or rear indenter available — tailor the system to the user’s requirements. The Horizon supports multiple tippers for faster/ easier production. The tipper’s reliable plate design allows for a maximum of 11 lines on a card. The tipper also has an integrated low foil sensor. Applies labels to the front of a card. It works with any activation labels designed for use with plastic cards, on a 3-inch core, an outside diameter no larger than 8 inches in diameter and with bottom-off-first orientation. Adds a greater degree of flexibility to the Horizon. Adding a flipper right before the stacker correctly orients the cards for placement into down stream equipment. The flipper CPE also enables the application of both front and rear laminates (Polyester Patch). Includes two removable “quick change” magazines each with a 250 embossed card capacity. The Horizon has the flexibility to be configured with up to three stacker CPEs (6 Magazines total). The Transport CPE can be used preserve CPE spaces for the future upgrades or can used with optional User Pro SDK to integrate non NBS hardware elements. The Transport CPE is a high throughput Horizon element, which can be ordered at time of purchase or field installed into existing systems. The addition of the Horizon mailer solution gives you the complete functionality of card personalization from start to envelope! Now you can personalize your cards and have them inserted into mail ready format giving you a totally automated card personalization solution. NBS Technologies is having a month end clearance on both their S-18 and D-40 ImageMaster Card Issuance Machines. Receive an additional 15% off the NBS Technologies S-18 and D-40 ImageMaster machines when you buy and have order shipped before March 31, 2016. Contact Symco Group today at 800-878-8002 or email us at info@symcogroup.com to purchase one or more NBS Technologies ImageMaster S-18 or D-40 card printers. Supports both internally generated layouts using ASCII text fields from host computer, or full Microsoft Windows® compatibility with Windows 7, Windows XP and Windows 2000 drivers. Supported by NBS SmartSys™ Tabletop Batch Issuance software, a user-friendly, Windows card design and production application, ideal for batch issuance. 300 dots per inch (11.8 dots per mm) resolution. Full range of monochrome color ribbons (full and half widths) available. PC Dash Board software for use in downloading additional fonts and images also used for flash loading of firmware for easy updates. It also can be used to back the machine settings. Supported by NBS SmartSys™ Tabletop machine control software, a user-friendly, Windows card design and production application, ideal for batch issuance. 300 dots per inch (11.8 dots per mm) resolution. Full range of monochrome color ribbons (full and half widths) available. Order $2,000 USD worth of CTC Spare Parts / Consumables and receive a 2.5% discount. Order $5,000 USD worth of CTC Spare Parts / Consumables and receive a 5% discount. Order $15,000 USD worth of CTC Spare Parts / Consumables and receive a 7.5% discount. 5% discount when you order 3 or more printheads (Part number 6423). Note: Printhead promotion cannot be combined with Stock and Save Promotion. Promotion ends March 31st 2016. Contact Symco Group at 800-878-8002 or email us at info@symcogroup.com to buy parts, Supplies or Printheads for your NBS card issuance equipment. With NBS Technology card solutions from Symco Group, you will be able to design one card or a batch of cards from basic identification cards through cards with RFID for greater security and tracking ability. The NBS Javelin J230i provides you with an inexpensive desktop solution to completely customize the cards. Symco Group is an authorized reseller for the entire line of card equipment and software from NBS Technologies. Contact Symco Group today (info@symcogroup.com or 800-878-8002) to purchase your next card issuance solution. 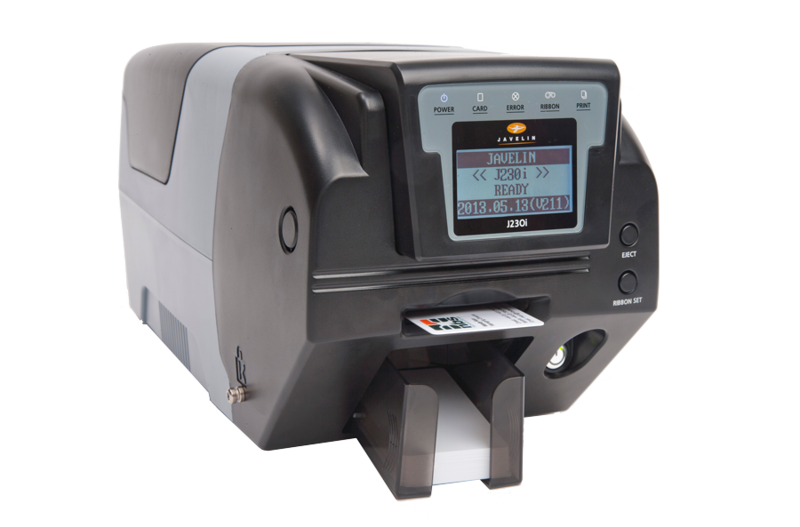 The J230i is our entry level card printer with built-in input hopper and output stacker. It prints in colour or monochrome, and an optional flipper is available for dual-side printing. The Javelin J230i card printer is reliable, compact and easyto-use, delivering outstanding performance at a great price. USB and Ethernet connectivity are standard features and a full range of encoding options are available. A colour ribbon and Javelin Card Designer ID card application software are supplied with each printer. START PRINTING OUT OF THE BOX!